Theresa Baumann and Sangeetha Anand spend 30 minutes a week online, helping Dallas ISD students with reading. The women work at Thompson Reuters, which is one of the companies participating in TutorMate. This week, students and tutors met in person. Only about one in three third graders are reading at grade level in Dallas County schools. And that can have big implications down the road since only one in five kids who read below grade level go on to college. A new kind of virtual tutoring aims to tackle that problem even earlier. And the volunteer tutors don’t even have to leave the office. At Nancy J. Cochran Elementary School in Dallas, a group of first and second graders read “Eat up, Chick!” The book’s about a baby chicken who won’t eat worms because she doesn’t like how they look. So, she tries other food – a carrot, a bone, some hay. One day, she finally tries a worm. And she likes it. On this day, the story for these kids continues in a different way. Principal DeMarcus Goree introduces his students to their tutors in person for the first time since they were paired up six months ago. He tells the kids to give them a round of applause. Dallas and Houston are the first school districts in the state to participate in Tutormate – a nationwide effort designed to increase the number of first and second graders reading at grade level. Here’s how it works: Every week, 40 volunteers from eight area businesses spend 30 minutes online with their students. The tutor and student can’t see each other, but they can hear each other. The students read and play games designed to strengthen their weak spots. Casondra Wallace is a first grade teacher at Cochran. "A lot of my kids who came to me were not on grade level this year, so just getting them to [a] first grade [level] has been a challenge," Wallace said. Wallace said her students looked forward to the weekly call from their tutors -- they love reading with someone who’s not their teacher. And it seems to be making a difference. “I have a girl who came in pre-k reading level and as of this week, she’s reading at a first grade level, which is amazing,” Wallace said. In Dallas, the program is a partnership between the district, the educational non-profit group Commit! and Innovations for Learning. All of the kids attend schools in the Moisés E. Molina High School feeder pattern in southwest Dallas. Companies participating in the program include Haynes & Booth, Intuit, Nielsen, Thompson Reuters, Comerica Bank and Expedia. 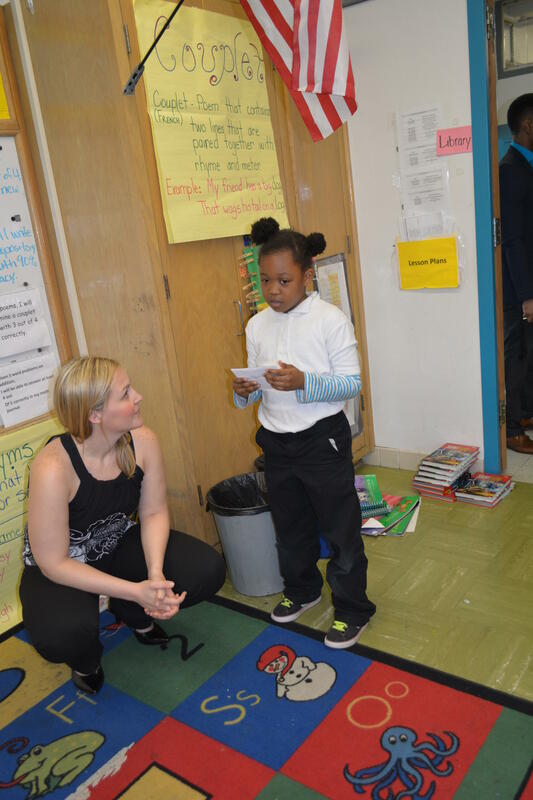 On Thursday, second grader Renee Wesley met her tutor, Brittany Sumrall, in person for the first time. Sumrall has spent the past six months helping Renee so that she can read on grade level. "I had a struggle of reading," Renee said. "Now I know how to read and it's great." Credit Andy Canales / Commit! On Thursday, 8-year-old Secora Wesley met her tutor Brittany Sumrall, who works for the Dallas school district's Human Capital Management Department, which is also participating in TutorMate. “You’ve done a great job,” Sumrall told her. “What’s your favorite book to read?” Sumrall asked. “Um, my favorite book to read? Um, I don’t know. It’s pretty difficult,” Secora said. “I like to read all kinds of books." Nancy Blake, who sells cash management services for Comerica, said she controls what's on the computer screen while her student follows along. They use flash cards and play a Tic-Tac-Toe game with words. "When we first started, she was very shy and quiet on the phone," Blake said. "But as we went through, she just got more excited and more cheerful and much more confident in her reading and talking to a stranger on the phone, which is hard when you're in first grade." So far, 14 cities around the country participate in TutorMate and there are plans to expand. Dan Weisberg, the program’s national director near Chicago, said there’s a growing need for tutors. And for these students, saying yes to reading could be the ultimate key to their future. An elementary school in Dallas is tearing up their grass courtyard, and turning it into a garden of native plant that don’t need a sprinkler system. Cochran Elementary is the first of many schools that will see new landscaping as part of a citywide effort to curb water use. How do the words we read on a page translate into the images we see in our head? Peter Mendelsund, Associate Art Director for Alfred A. Knopf Books, joins Krys Boyd on Think today. At 1 p.m., he’ll discuss the neuroscience behind reading, which he covers in his book What We See When We Read.